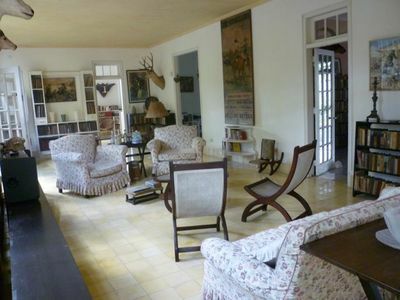 The living room of Ernest Hemingway's casa. I spent ten days in Havana, Cuba, from February 9, 2016 to February 19, 2016--roughly a month before President Obama made his historic trip. 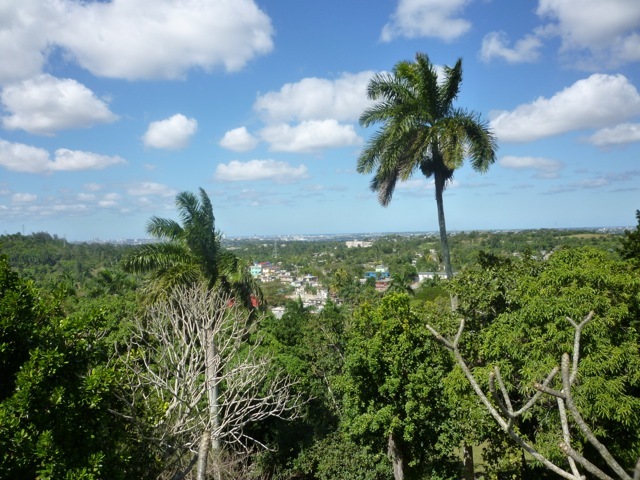 It was my first trip to Cuba, and I kept a close journal of my time there. I also wrote poetry there and I will include some of it in journal entries. Beautiful morning; I slept really well. Two kids we see at Cuba Libro often: Peter, a bilingual, bisexual poet and translator who rollerblades "professionally," that is, he makes videos of his rollerblading, and is into martial arts, especially jiujutsu--he got a 2nd degree black belt from North Korea, that in itself is a story; and his girlfriend, Julia, a doctor who works as a chef and tattoo artist. In Cuba, that is not unusual. Doctors make so little pay that they often quit medicine. All medical services are free (including plastic surgery)--though the waits at clinics are famous--so doctors are paid less than cab drivers. Cuba does not have a doctor shortage, since medical education is also free, but it does have a shortage of specialists. So medical specialists are forbidden to leave the country. How they keep up with progress in their fields is a mystery to me. There is no advertising--commercial, private--in Cuba. No billboards with models selling looks or products you can't have. No ads in Cuban newspapers or magazines. Except for ads, or billboards, for the government, the Revolucion. 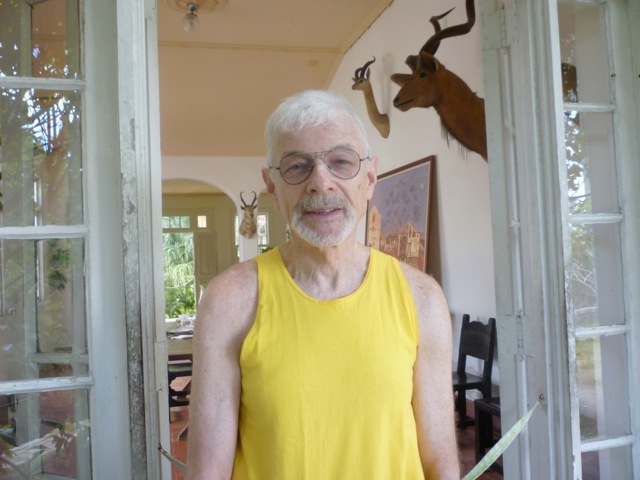 Hugh noticed that on Ash Wednesday, the day after we arrived, there were no ash crosses on any foreheads: in a formerly, almost all-Catholic country. We have seen a few nuns, and there are still working churches. The Pope was here Friday to meet the Prelate of the Russian Orthodox Church in a media-catching attempt at "rapprochement," and Hugh was sure he saw at least one priest at a big hotel in full Russian Orthodox "drag." But no one is talking about the Pope: not one cab driver or waiter. There are no pictures of him sold on the streets, no souvenirs of his visit. Hugh feels that the R.C. Church is rearing to make big-time come back here once U.S.-Cuban relations have been "normalized," i.e. we take back Cuba as a "trading partner." I'm sure that Christian fundamentalists, the Mormons, and other groups are as well. We get approached often by friendly, talkative Cuban men who tell us how much they love the U.S.--one went rhapsodic about the Yankees and wants to "see Yankee Stadium before I die!" --and Americans. They want to know where we're from, and how we like Cuba; then they ask for a "CUC." [equal to $1 USD]. One old man asked if we were married back in the U.S. and if we had kids. Hugh told him, "We are married to each other." The man's face went still for a moment, then he said, "Cuba is beautiful, si?" Sunday, Feb. 14, 2016. 10:15 A.M.
Valentines's Day is very importante in Cuba. Raul, our host at the casa, congratulated us at breakfast. "It is the day of lovers and friends." There are posters up all over town about it, and every restaurant has a greeting for the festivities. It may be the second most important day after New Year's, except for anniversaries of events in the Revolucion. Yesterday, after a leisurely breakfast, we arranged for a taxi driver to take us out to San Francisco, a town about an hour out of Havana, where the Casa and Museum Hemingway is. The car had no springs at all, the road mostly corrugated ruts, but the drive was interesting--very run-down, poor area, like one constant Cartier-Bresson photograph: people being their real selves every moment; outdoor markets; bus stops; schools; very scratchy-looking railroad stations for a country rail line; energetic kids and young people everywhere. The view from the highest point at casa Hemingway. Finally, we turn off the road, past a small farming settlement to the Hemingway "finca," or farm--a working farm he bought in the late 1930s. Probably cheaply. His house, which is actually closed to the public [except for certain high-paying tourists] but conversely "open" with large, view-capturing windows everywhere through which you can look in and take pictures, is on a beautiful high promontory. Views back to Havana, to the sea. Gleaming rivers nearby where he fished. Inside, herds of animal heads he shot: antelopes, cougar, buffalo. The rooms have been beautifully preserved, all of his personal articles--books, typewriters, boots, his World War I uniform, toiletry items like hair brushes, even toothbrushes and combs, even magazines he read or was featured in, like Life, are on display. There are pictures or formal portraits of him at various points in his life, and large, framed bullfight posters. The light, softly filtering through large trees and copious vines, is beautiful, like being in this nostalgic dream of a lost time, the 1940s through the end of the 1950s, when Ernest Hemingway was one of the world's most famous people. Ava Gardiner, Frank Sinatra, among other luminaries of the period, were house guests. The author beguiled by the Hemingway mystique. There is a short walk to a once-refreshing, deep pool--now drained; all dry concrete--with a cabana for changing, and an area under a classical portico for, I'm sure, snacks and drinks. Next to the pool is Hemingway's boat, the Pilar, up on supports, long out of any water. Down the hill, at the gift shop, filled with Che and Castro souvenirs, they sell miniatures of it. The house is so moving, private, and yet not that isolated or isolating, really, that I had a private, tearful moment remembering how much I loved his work when I was young. I wrote this, my own souvenir of the place. 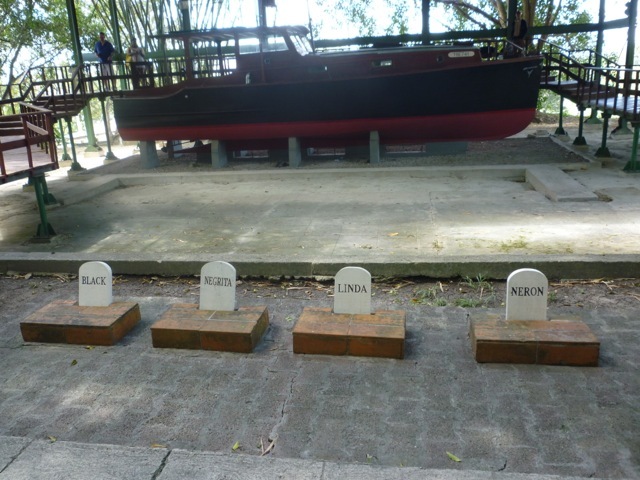 The Pilar, with the graves of Hemingway's dogs in front of it. Multiple award-winning author Perry Brass has published 19 books. His newest is The Manly Pursuit of Desire and Love, Your Guide to Life, Happiness, and Emotional and Sexual Fulfillment in a Closed-Down World which just won a Silver Ippy Medal for Best LGBT Non-Fiction, but was banned on Facebook as was his previous The Manly Art of Seduction. His thriller novel Carnal Sacraments, A Historical Novel of the Future Set in the Last Quarter of the 21st Century, has just been translated into Italian. He can be reached through his website, www.perrybrass.com.